It seems as if you can’t move for sourdough in some form or another in East London. 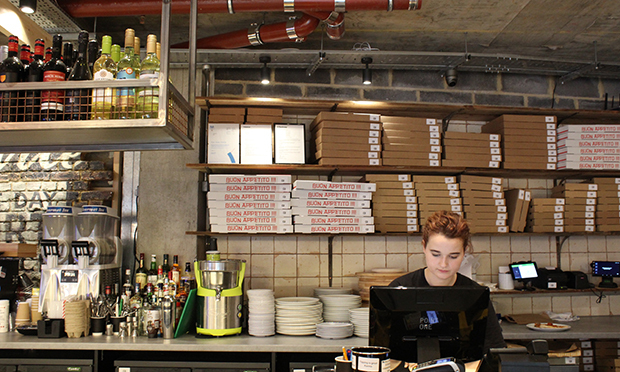 So the arrival of Fold, a New York style pizza spot, is a welcome addition to the Hackney scene. Unlike its European equivalents, authentic New York pizza has a much longer fermentation time of over two days. This results in a thicker base, which is also ultra-crisp and airy, and (most importantly) means you can load it up with extra toppings. Following the success of their first branch in Soho, US expats Michael and Annabel Wheeler decided to bring their traditional Big Apple slice to Hackney and establish a more community-oriented joint. The restaurant, tucked just off of Mare Street, recreates the look of a NY pizzeria, with exposed brickwork and splashes of New York Taxi yellow. Visiting on a Monday lunchtime, we head to the front counter and take a peek at the “pie”’ being cooked on the coal baked oven in the open kitchen. As you would probably expect in a US-style pizzeria, Fold certainly doesn’t scrimp on portion sizes. We see pizzas as big as 20” stacked up by the counter, although there is also the option to order by the slice. Owner Annabel Wheeler talks us through the menu and carefully explains the unique features of the New York style pizza, pointing out that they hold up to 40 per cent more mozzarella than a typical margarita Neapolitan. While it may only be a Monday lunchtime, we decide to go all out and order a selection of starters and pizzas. First up comes a lasagna ball, which we decide to name “The Donald” owing to a jauntily placed slither of parmesan draped on its top. Suitably drenched in tomato sauce, I am told it makes a satisfying entrée with its layers of fresh pasta and rich mince. Next comes a couple of bread-based starters. The cheesy garlic bread dunkers are nicely oozing in garlic oil with a crispy layer of parmesan on the top. However we are less sold on the “spicy pink sauce”, a mix of cream and tomatoes which doesn’t really add much to the dunkers. We also order mozzarella sticks, accompanied with a much simpler and more pleasing marianna sauce. Crispy on the outside and filled to the brim with mozzarella, you can’t really go wrong. 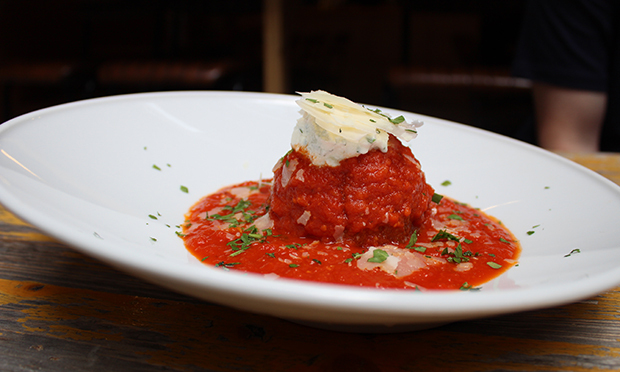 While the lasagna ball is a good size for one, the two bread-based starters would most definitely be considered “sharing portions”. So we resist polishing them off to make room for pizza. The pizzas are soon whisked out and perched on special stands on the table, ideal for sharing. With so many toppings to choose from, we go half and half for the first pizza. On one side is Juliet, an indulgent mix of mozzarella, gorgonzola dolce, fig jam and parma ham, topped off with a balsamic glaze. 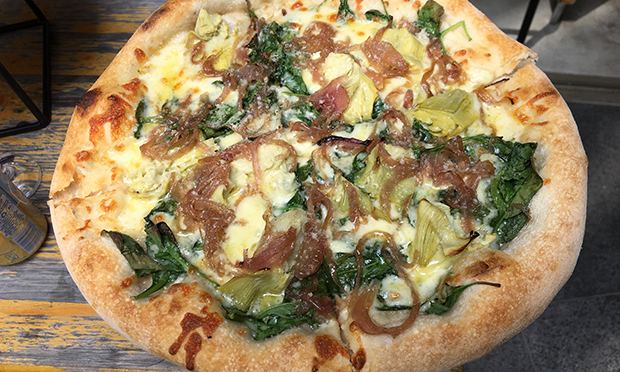 While delicious for the first few bites, the Juliet topping becomes slightly too rich and we move on to the other side of the pizza – The Butcher Shop. As you would expect from the name, it consists of a medley of different meats: bacon, pepperoni, sliced meatball, Cumberland sausage and ham. However, as with the Juliet it all gets a bit too much after a couple of slices and the individual flavours of each ingredient get a bit lost in the overwhelming quantity of meat. Despite the lavish toppings, the pizza base certainly holds its own with a light and crispy bite and a hefty mouthful of crust with each slice. We then tuck into the vegetarian pizzas, starting with my favourite, Big Daddy. Layered with spinach, artichoke hearts garlic oil, mozzarella and caramelised onion, there’s just the right balance of fresh greens cut through with the sweetness of the onions and lashings of gooey mozzarella. The sheer amount of mozzarella on these pizzas becomes even more apparent when we tear into the Grandma’s pie, with its effortlessly simple mix of freshly chopped tomatoes, parsley and pecorino cheese. But vegans need not fear, as Fold has an option to swap any cheese for vegan cheese – as you would expect from any self-respecting Hackney eatery these days. After our belly-busting starters and pizza, there’s simply no room for dessert. However, Fold’s dessert pizzas, which are slathered in Nutella, banana, coconut and ice cream, do sound like a dream. Annabel tells us that there are some customers who visit solely for an afternoon dessert pizza fix. The philosophy at Fold is definitely more is good and much more is even better, but that’s all part of its over-the-top New York charm. Of course, there’s always the option to go for a single slice but I’d say your best bet is to gather a big group of friends, tuck into a selection of pies and starters – the way it oughta be.